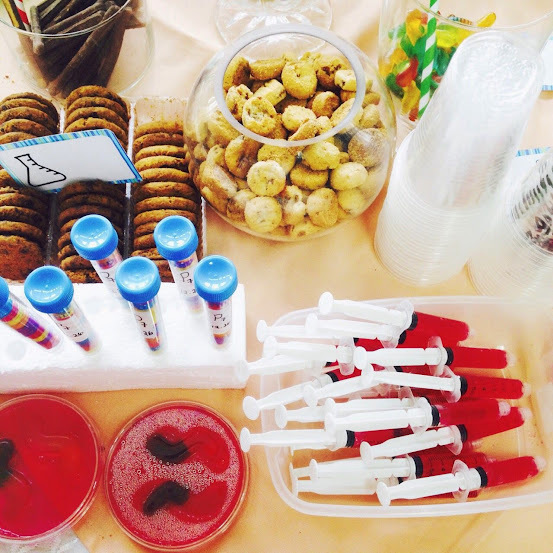 Peaches turned 7 last December 26 and she had a Mad Science Birthday party. She is determined to become a scientist, chemist to be exact, when she grows up. I asked her several times since August if she was sure she wants a Mad Science. I knew it’s going to be hard work because this specific theme is new to party planners and suppliers so it’s either I pay A LOT for a customized party or DIY it. 1. Venue – My inlaws’ condo has a nice Penthouse. It has a kiddie playground at the back of it and it saves me from getting too many pre-party activities. 2. Decorations– I had around 100 balloonderitas on the ceiling, I chose orange, green and pink as the colors. I then created pompoms out of crepe papers and hanged them on the activity area. 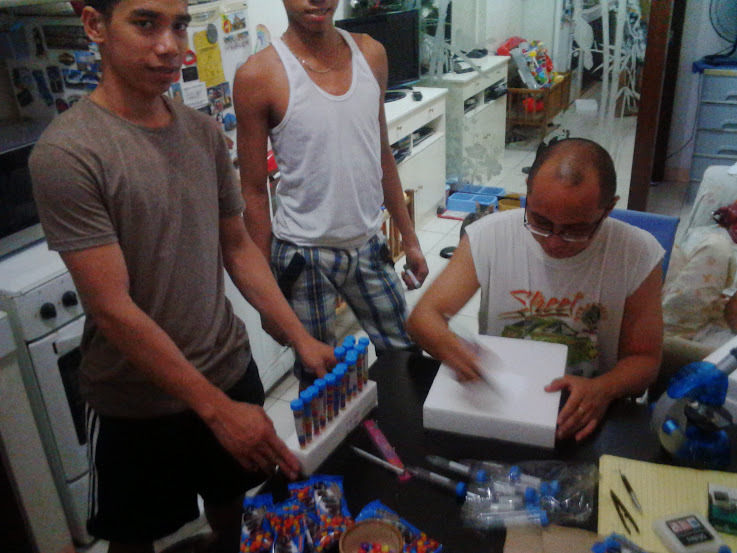 I bought pre cut styrofoam from National Bookstore and had my husband and our staff to cut letters for Peaches’ name. My good friend Kate gave us buntings for the front area and the candy buffet. Lookit! Kate also gave us this nice print out, which I placed in the Entrance. If you’re wondering, that’s my husband in yellow minion shirt 🙂 Peaches asked him to be her minion like Gru’s scientist LOL. And that’s my pretty sisterette, Kat. 3. Candy buffet– I placed nips on plastic test tubes and created a make shift test tube stand out of the scrap styro foam. This was a huge hit with our little guests and the parents too! It’s important that I used plastic laboratory supplies because I didn’t want to endanger any kid. I made jellos (red and green) and molded them on a plastic petri dish and placed gummy worms. Some jello, I aspirated using plastic syringes (without needles!). For the candy holders, I drew graduation on plastic cups ala beaker. The rest of the candy buffet is just your normal candies and cookies which I placed on bowls and decanters. 4. Centerpiece– My husband took photos of our little girl, I then jazzed it up a bit, had it printed and placed it in the middle of a paper flower I created. The kids took home their own slime! 6. Loot bags- now, I am really not a fan of this so I prepared a simple Scientist worthy loot bag. I placed a kiddie eyeglasses (which turned out to be another hit! ), their own Scientist ID, pen and paper, personalized hand sanitizer and a thank you note from Peaches. What do you think? The cupcake is red velvet sans the lavish cream cheese on top, instead we put fondant shaped as molecules. 9. Kiddie Salon– YEEESSS, I got one because Scientists need to be glammed up too, ya know! But no tiaras! only clips, headbands and other hair accessories… plus colored hair wax too! 10. Host – I hired a nice host that took charge of the opening, program follow ang games for kids and their yayas. Over all, I was told the kids and parents enjoyed the party. It was really a simple event and could be more grander than it is but it was enough for my daughter who couldn’t stop coming up to me and thanking me for the best birthday party ever. She’s really the sweetest girl! The theme is so unique! I love how you made most of the decorations and food by yourself and they’re very creative. The mad scientists show I think is truly fun for the kids. They’ll love science even more. Btw belated Happy Birthday to Peaches! Yes, my friend told me I sealed the kids’ love for Science. I had the food catered though heheh… I just did the candy buffet and the cake and cupcakes! That party is really nice and not common too. Kudos to you! My son will hit 7 yrs old this year and until now, he doesn’t know his theme yet or gusto ba niya ng party or we’ll just travel. HBD Peaches 🙂 That’s a Nice Party! uber cute ng candy buffet and mad science theme? love the idea! Happy birthday, kiddo! That’s a very unique theme that you got there. Hope you and your friends enjoyed! nice idea for a birthday party. I like pretty well the candy buffet. Im sure kids enjoyed much! They did! I think some of the oldies went to join the kids on some of the interactive experiments too! wow! i wish my kids know your kids and they got invited, heehee. i love educational-themed parties like these. especially when science is involved, my little nerds would’ve really partied, haha. Aww May! I would have invited them! We don’t expect too many kids because it’s the day after Christmas. Most of Peaches’ classmates are either out of the country or out of town. What a unique party theme. Its my youngest 7th bday too in a couple of months and we were thinking of a rock star party since he is into drums and music. Looks like a super fun party! My son has attended a few Mad Science parties, and I really like their activities. Super great way for the kids to learn cool stuff. I like the mad science concept for a party. It’s so cool. Happy birthday to her and good luck to her goal of being a scientist. WOW! That’s quite a theme for a 7th birthday! Belated Happy Birthday Peaches! This is such a cool party!!! It’s great to see the kids having fun but get educated on some science at the same time. Aah I love this! I had actually loved this theme every since but my son is still too young. I’ll surely refer back to this post for a future party! This is so adorable theme for a birthday party. Everyone was enjoying the party. This is so nerdy cool! Love the details! 🙂 I’ve also attended a party where Mad Science Ph was invited and I thought it was awesome. Nothing could be greater than labor of love. What you prepared for Peaches was a family collaboration that considered what the celebrant wanted and so much more. Belated happy birthday to your sweet and pretty daughter! Judging from the photos, Peaches had loads of fun on her birthday! Mommy Peachy recently posted…2 in 1 Mattresses: Because Great Little Ideas Add Up! Wow Career! Galing ah! I like how it’s not a regular theme but you were able to make it as special as possible for your little one. I’m sure Peaches will have beautiful memories to look back at! What a wonderful party! Especially since it was DIY! Your daughter sure does love Science! Happy 7th Birthday to Peaches! I bet your daughter will be a great scientist when she grows up. I love the idea Renz. Belated happy birthday to your daughter. Ang ganda ng party, it’s simple but it looked like the kids had a lot of fun.